Over the past 25 years, NASA has launched a series of four telescopes known as the great observatories. Designed to study the universe across the electromagnetic spectrum, these missions have been essential in astronomical research. The Hubble Space Telescope, launched in 1990, is sensitive to ultraviolet, visible, and near-infrared light. The Compton Gamma Ray Observatory (1990-2000) studied, well, gamma rays. The Chandra X-Ray observatory (1999-present), the third to be launched, studies x-rays. 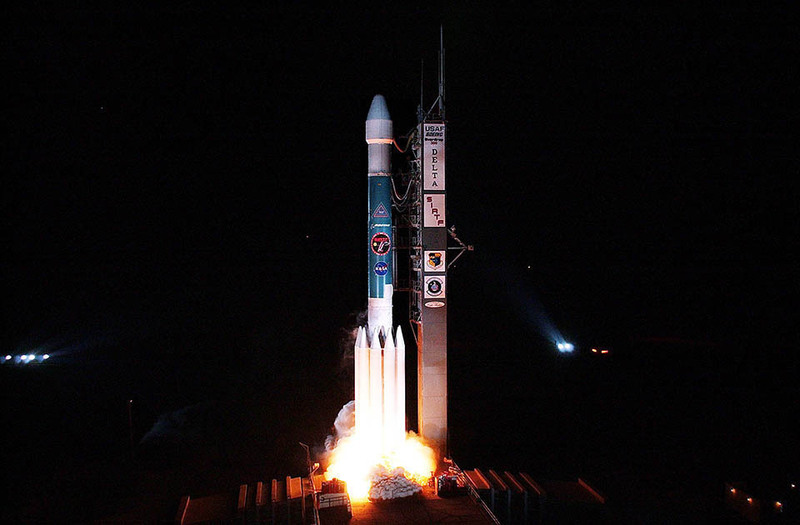 The launch of Spitzer atop a Delta II rocket in 2003. The fourth and final great observatory was the Spitzer Space Telescope. Launched in 2003, it is an infrared telescope. As an infrared telescope, its detectors were designed to measure radiation that is emitted at wavelengths between 3 and 150 microns. Objects with temperatures between 20 and 1000 Kelvin emit most of their flux at these wavelengths, making Spitzer a telescope optimized for studying objects cooler than stars, such as brown dwarfs, planets (both in our solar system and outside! ), and dust in galaxies. Spitzer is facing some serious challenges. First off, it orbits the Sun in nearly the same orbit as the Earth, so it’s around 1 AU from the Sun. As a “habitable zone” object, Spitzer itself should be very bright in the infrared! 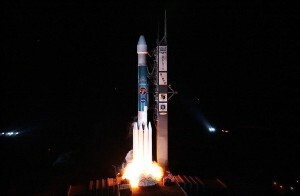 To ensure that its detectors were able to identify other objects besides radiation from the telescope itself, Spitzer was launched with a supply of liquid helium to use as a coolant, keeping the telescope working at about 1.2 Kelvin and radiating at much longer wavelengths than its detectors probe. For six years, Spitzer successfully carried out observations throughout the mid and far infrared. Unfortunately, the coolant ran out in 2009, causing the temperature of the telescope to begin to rise. As the temperature rose, the telescope became brighter and brighter in the infrared, making observations harder. In fact, “warm Spitzer” is too bright to carry out observations at any wavelengths longer than 5 microns. Spitzer was launched with three instruments: a mid-IR imaging camera (IRAC) capable of observations from 3-8 microns, a mid-IR spectrograph (IRS) useful from 5-40 microns, and a far-IR imaging camera (MIPS) that can collect images at wavelengths from 24-160 microns. With the loss of coolant, all instruments except IRAC were discontinued, and IRAC itself lost half its capabilities. Despite this setback, IRAC has continued working, and various groups have managed to invent new observing techniques to make the instrument more sensitive than ever before! The noise properties of the instrument are extremely well understood, meaning any instrumental effects can be mitigated. Moreover, some instrumental effects have been removed by Spitzer’s relatively new ability to stare directly at one patch of the sky for extended observations (like Kepler did), meaning the same star falls on the same pixel on the detector for an entire observation. As a result, small changes in the detector’s sensitivity across (and inside!) individual pixels do not affect individual science observations. An artist’s impression of the Spitzer space telescope as it images the galaxy. While IRAC is continuing to work, Spitzer is facing other challenges. Unlike Hubble, but like Kepler, the telescope orbits the Sun, not the Earth, in an Earth-trailing orbit. This means the telescope orbits the Sun every ~375 days, and every year moves slightly further away from the Earth. Eventually, the Sun will block our line of sight to Spitzer, and we will not be able to communicate with it. Fortunately, this won’t happen until about 2020, but it does provide a definite upper limit on the telescope’s longevity. Finally, the most serious threat to Spitzer’s continued longevity doesn’t come from space, but from NASA itself. As we wrote about previously, Spitzer was asked to participate in NASA’s senior review, where all active missions working beyond their expected lifetime compete for additional funding to extend their missions. The Senior Review panel did not approve extended operations, recommending that Spitzer be shuttered at the end of the year. 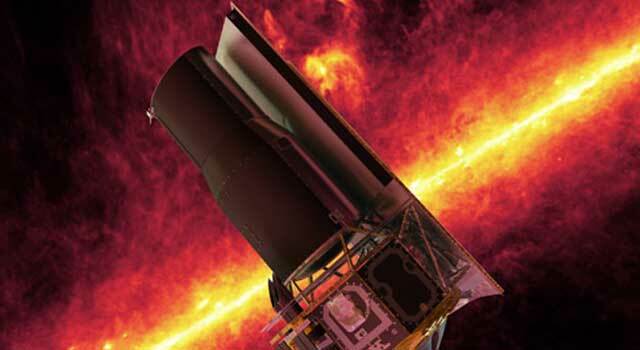 Without a significant change to the funding situation in NASA, it is likely that this will be the end of Spitzer. Despite all these challenges, it’s not all dark! IRAC is still, ten years after launch, not only working, but improving each year! After the senior review, NASA asked Spitzer to submit a revised budget to support a continuing mission, and to publish a call for proposals for Cycle 11. This is contingent on NASA finding continued funding for the mission, and not a guarantee that the upcoming cycle will occur. Hopefully, Spitzer can continue to operate until the 2018 launch of the James Webb Space Telescope. The goal of the Spitzer team is to be able to support operations until that time; without Spitzer (or SOFIA, also facing suspension of operations), NASA has no capabilities to observe the universe in the mid-IR. The Spitzer team is hopeful that their revised budget will be accepted, and a continuing mission will occur. However, there are no guarantees at this time. If you use Spitzer or plan to someday use Spitzer, and want to support the telescope, the Spitzer team suggests that one way to show your interest in continued operations is to email Paul Hertz or John Grunsfeld to explain why a continued Spitzer mission is essential for your science and future career.